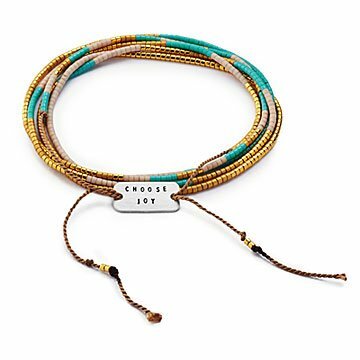 A beaded bracelet with an inspirational message: "Choose joy." Happiness doesn't always just happen—sometimes it takes extra effort to choose joy in our everyday lives. Christina Kober crafts this one-of-a-kind bracelet with silk thread and silver plate, creating a wearable reminder that we have more control over our feelings than we realize. Keep it as a pick-me-up for yourself, or pass it on to a friend who would appreciate an inspiration boost. Adjustable. Handmade by in Nashville, Tennessee. Christina Kober has always had a connection to jewelry. At just 14, she worked at her father’s jeweler supply store and experimented a bit in making her own—not realizing what a passion it would become for her later. It wasn’t until she graduated college that she delved into the design and jewelry-making process more seriously and slowly became an expert in her own right. Christina’s simple, inspirational pieces reflect her glass-half-full personality and overall positive spirit. This is beautiful, but it is much smaller/delicate than I expected.